Back in January, I started a gallery wall in our hallway using some Ikea frames that I had around the house. I only had those 4 frames and the closest Ikea is almost 2 hours away, so it stayed like that until just last week. If I'm honest, there's another reason why it took me so long to finish this product; hanging a gallery wall takes a lot of effort. 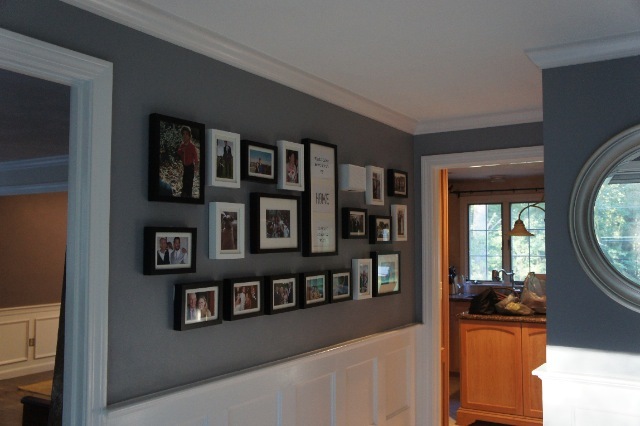 I think we've been led to believe that it's a quick and easy project based on the sheer number of beautiful gallery walls we're exposed to. Or the fact that many bloggers have offered tips and tricks for getting the project done. And I'm not saying that those tips and tricks don't help, they do (and I even used one of them), but it's still a lot of work. Ok, I'm done complaining. If you're looking for one more tutorial to convince yourself that this is an easy project, here's the method that I used. I'm not even going to venture that this is the quickest, fastest, best way to do this, but it worked for me. Warning: This project is still a royal pain in the tookis. 1. 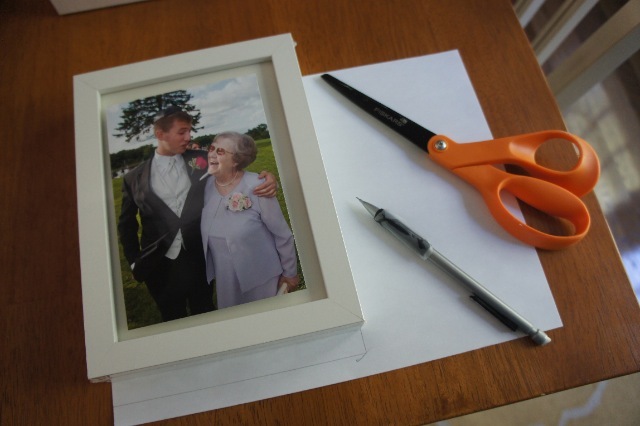 Trace the shape of your frames on paper, cut them out and set aside. 2. 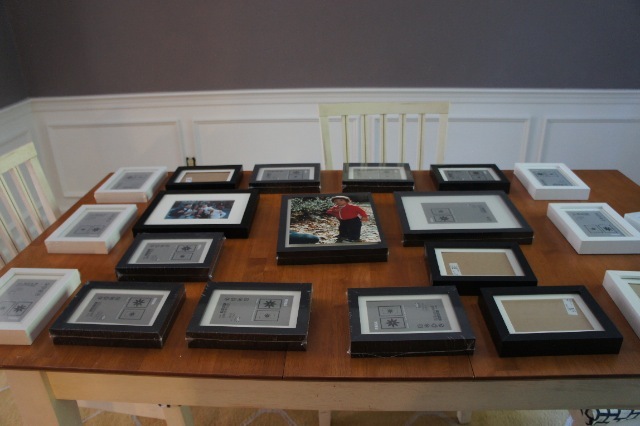 Find a large clear area to work with your frames. Play around with shapes and layouts and figure out which way frames will need to go based on photo orientation (portrait or landscape). 3. 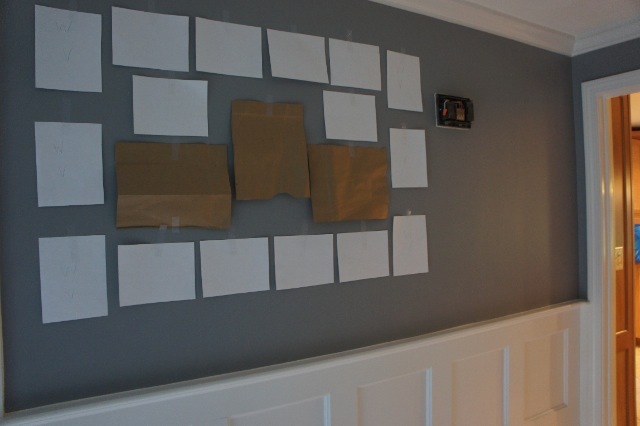 Once you have a layout in mind, take the paper shapes and tape them up on your gallery wall. If you want to make changes, you can move the paper shapes around until you find something that you like. (I had 6 pictures that were portrait orientation, so I found it helpful to mark 6 of the paper shapes with a "P"). 4. Once you have a layout you like, it's time to hang the frames. If you are using nails, you can measure and mark on the paper where the nail needs to go then hammer a little hole right through the paper. I decided not to use hammer and nail because I bought the really cheap frames from Ikea and they're pretty impossible to hang that way. 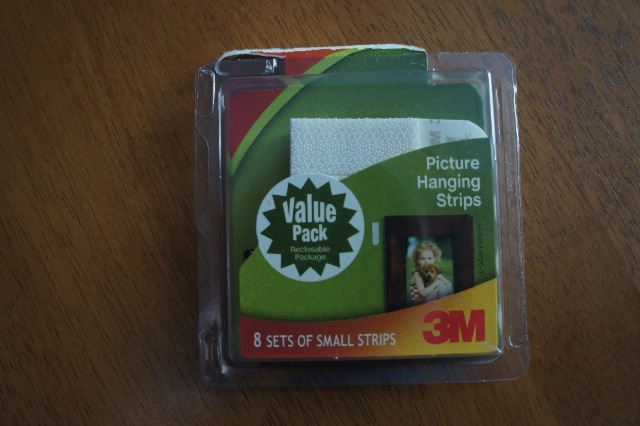 Instead, I used 3M Picture Hanging Strips. They're amaze balls. The back of my frames are really narrow, so I had to cut these bad boys in half, but it's seeming to do the trick (pictures are still on the walls one week later!). 5. Because I didn't have a nail hole in the wall to line things up, I left the paper shapes taped up, removing them one at a time, and replacing them with the actual frame. I also got out my measuring tape out just to make sure things were pretty well aligned. And voila! Gallery wall hung in 9 months! I'm sure that's a record (of some sort). Yea, see that doorbell there. I painted it white in hopes it would blend in. Pretty incognito, right? I also incorporated a little word art based on this Pinterest Pin. 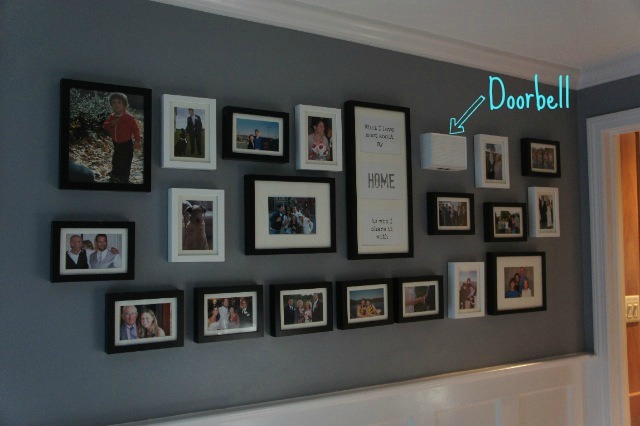 BTW: love your wall color! Great job on your gallery wall! I love the fact that the doorbell blends right in! Have a great weekend. 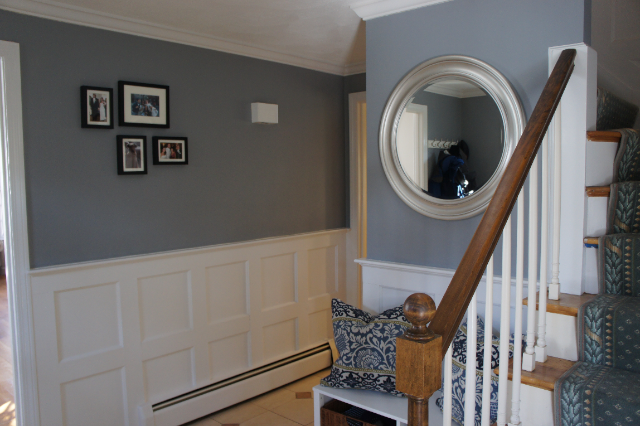 Your foyer (or hallway?) is really pretty! I love the woodwork and choice of paint color. That does look like a lot of work...that's probably why I haven't put up a gallery wall yet.